An American Between Worlds: Why Should I Speak It If You Don't? My husband and I often speak English with one another. In fact, we speak English with one another most of the time. It comes naturally since that was the language we spoke when we met 16 years ago on the Emerald Isle of Ireland, in Mary Ryan's Hostel in Galway. Wow, 16 years!! I didn't speak a word of German at the time and my future husband was in Ireland to speak English - so it all worked out well. Of course, he wasn't looking for a future American wife and I wasn't looking for a future German husband. We were there to meet the Irish! Not other foreigners! Well, be it as it may, we fell in love and I ended up taking a leave of absence from my studies to spend two years in Germany with my future husband where we finally tied the knot and moved to Seattle, Washington. While in Germany I spent grueling hours at the Volkshochschule followed by even more grueling hours at the university in Kiel learning German. Textwiedergabe - I remember that word clearly and it can still bring dread up my spine and fear into my heart. The ultimate of torture touted as "learning German." Ugh, I can still remember sitting there with my pencil poised for the moment of truth. That coupled with trying to pronounce the letters ä, ö and ü while a kind-hearted teacher squishes your mouth into place was enough to make me want to fall to the floor and plead for mercy. "Try saying "eee" while rounding your lips like this," the teacher would say. "Ok, yea, I get it but now how do I remember all of that while trying to use that sound in the middle of a word which is in the middle of a sentence!?" would be my exasperated reply. In any case, tonight my 6-year-old son heard my husband and I speaking English with one another and promptly said to us (in German), "Why are us kids supposed to speak German together while you two speak English with one another?" My husband and I looked at one another and and said (in German), "You are right! We should be speaking German. Ok, here is the deal, we'll speak German with one another from now on and you'll agree to speak more German with your siblings, ok?" Our son pursed his lips to think about the deal. He clearly smelled something rotten. And then I quickly added, "And you stop calling me Corey and just call me Mama from now on, ok?" Our son started to look at us with clear suspicion while my husband topped it off with, "And you will always call me Papa, ok?" Well, let's just say that we all eventually shook on it and agreed to the terms. Whether my son has any idea of what he really agreed to will be seen soon enough. I think he would have agreed to anything just to get the heck away from his crazy, begging, pleading parents. Is this what a bilingual family has come down to? Making language deals over the dinner table? Well, if it works it is worth it right? I guess I had better remember to speak German with my husband from now on! I mean, a deal IS a deal, right? Hey, we have the same problem!! When my husband moved to the U.S., we started speaking English together so he would be comfortable in the workplace, while still speaking German to the kids. And now 13 years later, it's so difficult to speak German with him. But now that you put it like this, it makes perfect sense - it's obvious what we need to do! Hmmm. Thanks for a great post! Let me know how things go in your house and what kinds of solutions you find. We've pretty much just switched to as much German as possible (which actually IS good after all). Great to hear from you! I love keeping up with things in your life via your blog! 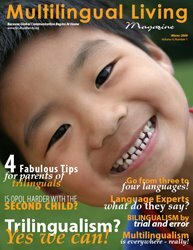 Corey- I've just recently found your blog and am glad to have a glimpse of what raising children bilingual will be like several years down the road. My husband and I expect our first baby in July, but it's nice to know what the future may hold, no matter how difficult the battle to get our kids to speak Spanish will be! Hi Corey: We speak a bit of German at home, but mine's just not good enough to chat as much as I should! so my child has to get most of it at school. The Weiso Weshalb Warum series of books is just wonderful, and they make totally awesome CD's as well. I would HIGHLY suggest that you buy the CD AND the book for your child who doesn't think that Ritters come from Germany -- the CD will fix things right up! The series is lovely. The CD's don't read the book. They go loosely along the same topics, but they act out adventures with the words. My blog is www.anachronisticblog.com and my website is www.anachronisticmom.com. Corey, don't despair! 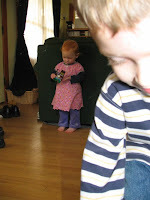 The kids language between themselves is sort of their choice, what they are comfortable with. My children started out speaking Spanish to each other, but at some point, when the oldest was 8 and youngest was 4, they just switched to English. They said it was easier to play in English, and there it was. My husband and I still speak Spanish to each other, and he speaks Spanish to them, but they are most definitely doing English with each other. They study Spanish in school, and speak to those that require it in Spanish, but just not to each other. Dinner conversation jumps between the two languages, depending on who is talking to whom.